3′ x 9′ glass windows to view the reef and marine life below. a spacious deck, a glass bottom window and outfitted to accommodate scuba divers, snorkelers and sightseers. 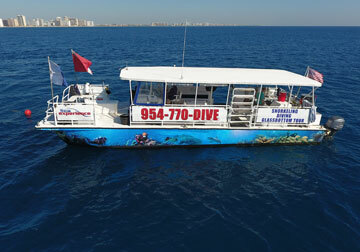 This dive and snorkel boat has many amenities for the passengers; Among which include a large glass bottom viewing window, fresh water shower, marine head (toilet for the landlubbers), five entry points, two ladders, a large ice chest for beverages, rinse buckets for masks and cameras and a spacious deck for both shade and open sun. Another main feature is the twin 225 HP outboard engines, which are as quiet as they are efficient, allowing for a cruising speed of around 20 knots. The crew of both our vessels are all certified scuba divers and therefore have been instructed in many areas of safety. Your safety is always our main concern and the friendly crew is always willing to lend assistance whenever needed or asked for. The Sea Experience is equipped with many safety items such as first aid, emergency oxygen, life jackets and emergency exits are everywhere. 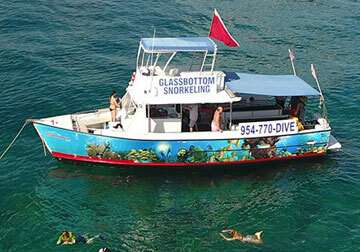 It is our pleasure to ensure that everyone has a safe and enjoyable snorkeling experience.